as i have been answering emails the past few weeks, one of the most reoccurring emails i receive is one asking about items i would recommend on having in your closet- the must haves. i've also got quite a few emails from women wanting to completely redo their wardrobe but aren't even sure where to begin! i can completely understand this! i went through a similar thing a few years ago as i was trying to start over but keep a few favorites here and there. i figured this would be a good way to kill a few birds with one stone by answering a few emails, but also show some photos and give some options to those interested in doing a little revamping. there are two photos for each "category" below, the top photos are items i consider basics and the bottom photo are the extras that are for fun if you want a few more ideas of items to add on your next shopping spree! alright, let's start with tops! these are your definite basics. 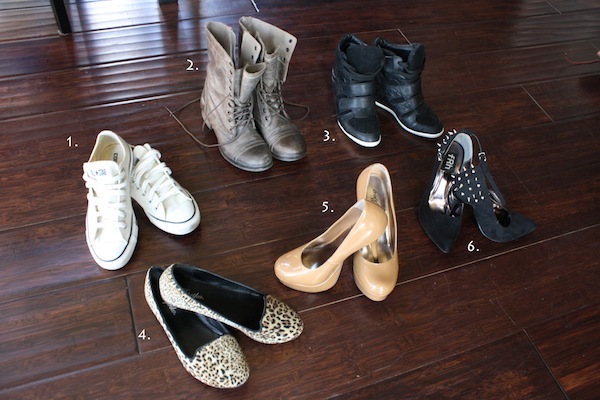 items i think every girl should have in her closet! 1. plaid button up. this is actually a men's from h&m and i love it more than most of my "girl" shirts! 2. a dark or light chambray has become a closet staple. so much so, that i now own 5! 3. your everyday white tee. so boring. so basic. SO necessary. now i know it seems a little steep- but i have had over 50 white tees in my lifetime (i'm sure of it) and this is by far my favorite. it's worth every penny! 4. boyfriend blazer. really there's not much else to say besides, if you don't have one, get one! 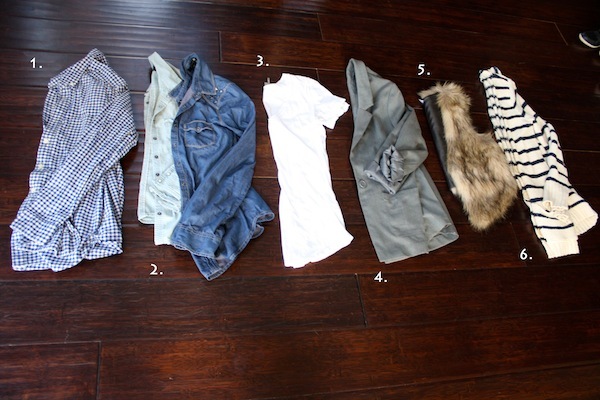 5. fur vest. yes, it took me a minute, but once i jumped on the train, i didn't want to get off! a fur vest has become another must have and although some may not think this should go in the "basics" category, i disagree. 6. a long, comfy cardigan. or any cardigan for that matter. i'm also a fan of colored cardigans, printed cardigans, and just any about any other cardigan you can think of. now for the fun extras! 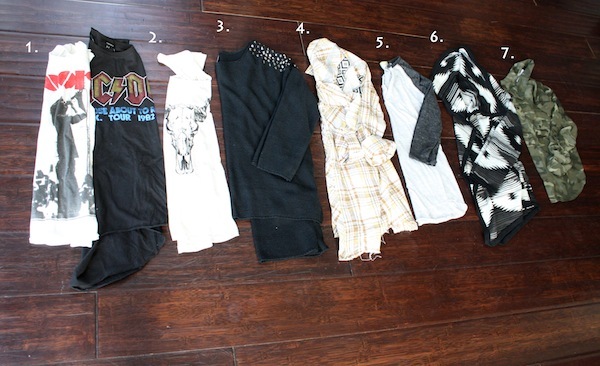 1. rocker tee's- definitely a must in my closet. it's a fun way to dress down anything, then add a beanie and viola! 2. other printed tanks - especially bull heads, skulls, feathers, dreamcatchers, basically anything fun and different is in! 3. studded shoulder sweater. we all know everything is going "studded"- boots, sweaters, jackets...so get on it! 4. casual flannel. this free people one shown here even has an aztec print on the back- the best of both worlds! 5. baseball tee. thee best way to do the comfy, laid back look, but still cute and feminine. 6. printed cardigan. prints work, so why not enjoy them? 2. ripped jeans. for your comfy baseball tee or rocker tee type days. 3. colored jeans. they were all the rave for summer and i still can't get enough! these are a light rust type color here, but i love all colors and have about every color in the rainbow! 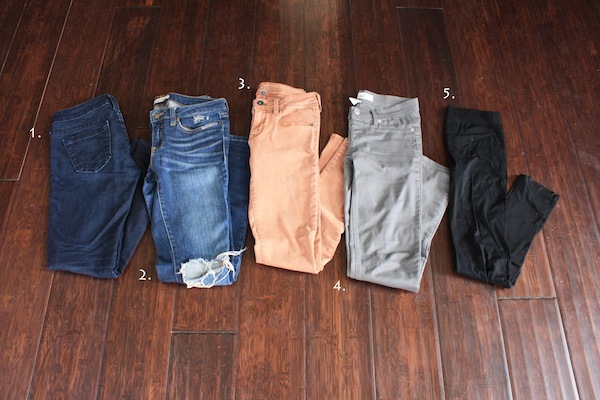 4. simple color jeans. your greys, blacks, beiges, dark blue and any other "not too crazy" of colors. 5. basic black legging. only what i would wear every day if it were socially acceptable. 1. pleather leggings. windsor has done me well and keeps stocked with these amazing colors! red & black are my favorites! 2. printed leggings. another style i was slightly leery of, but once i realized how fun and easy they were to pair, i needed them all! 3. camo. again!. i'm telling you, it's slowly taking over my closet, but is so nice because it can almost be used as a neutral. 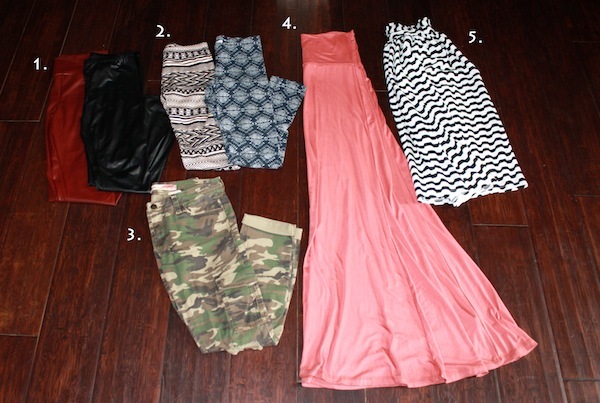 4. maxi skirt. an absolute must, especially for summer! obviously, we can't forget shoes! 1. all star low top converse. i have these in 5 colors. let's just say, i like converse and they are a basic. always. 2. lace up boots. i'm a bit of a sucker for steve maddens, but you can find these everywhere these days! a definite must! 3. sneaker wedges. i wouldn't normally include these, but as soon as i realized how comfortable and practical they are, and the fact that they go with everything, i decided they needed to be added! 4. printed flats. along with basic flats, they are the universal shoe that goes with just about anything. 6. black stilettos. another must. i don't feel like i'm telling you anything you don't already know! 1. rain boots. no these are not the hunters like every other blogger wears. but they were also $6 and super cute, so my wallet felt better about them. either way, i don't wear them enough to drop the $130, but i do think they are fun and definitely useful! 2. colorblock wedges. possibly making their way into my top 3 favorite pairs. plus i get mounds of comments on these lovelies! 3. platform heel. these are definitely for some, and not for others. people kind of have a love/hate relationship with them, but they seem to go with quite a bit and are much easier to walk in than i thought they would be! 4. black strap stilettos. fancy and fabulous. especially when paired with liquid leggings! 6. oxfords. actually, now that i think about it, these should probably be added to my basics! alright, moving on to accessories! 1. basic cable knit scarf. a must. especially if you live in utah! 2. printed scarf. it can add so much to an outfit or dress up a white tee and jeans. 3-4. basic clutch. these are two of my favorites and between the two you can pair them with any outfit to add the final touch. 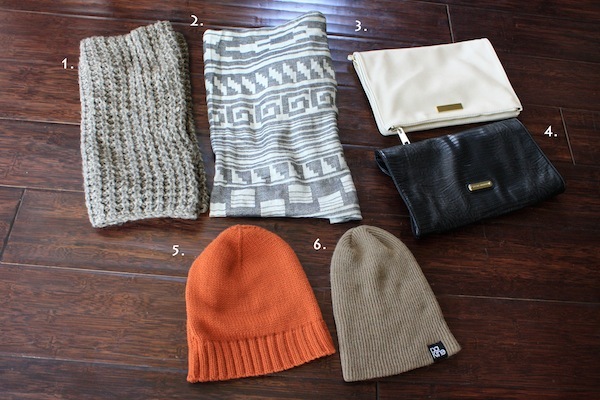 5-6. beanies. if you follow me, you're aware that i am slightly obsessed. 1. baseball cap. for me- a basic. for most others, this isn't necessarily a "closet staple" but it does go great with a baseball tee! 2. fun colored beanie. alright, i love beanies. what can i say? 3. panama hat. so fun and so my new favorite hat. did i mention that i like hats? 4. printed clutch. this nine west clutch is the perfect accessory for your LBD or your sleek all-black outfit. 5. colorful clutch. a fun color and so practical! 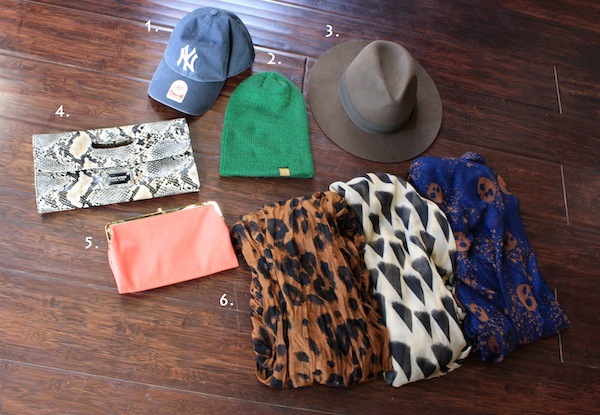 6. printed scarves. any and every print can make an outfit to the next level. last, but definitely not least...jackets! 1. basic faux leather jacket. a classic favorite. 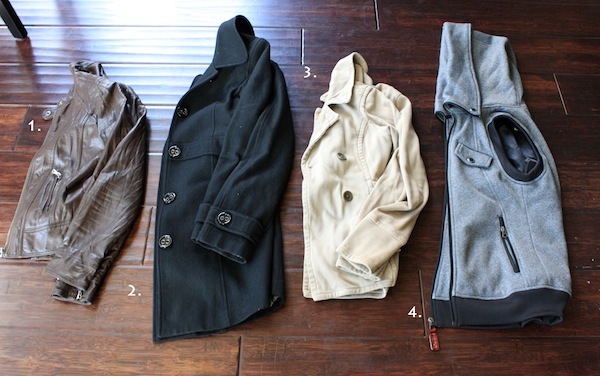 2. black peacoat. always a great choice, especially when paired with a cute chunky scarf! 3. beige jacket. beige or olive green. you choose, but i believe it's a necessity. 4. a warm, cute vest. this burton vest is so warm and i love making it look semi dressy versus outdoorsy casual, but i've also been eyeing the northface puffy vests. so cute! 1. houndstooth peacoat. or any fun printed jacket for that matter. still classy, but adds a little extra "umpf" to your outfit. 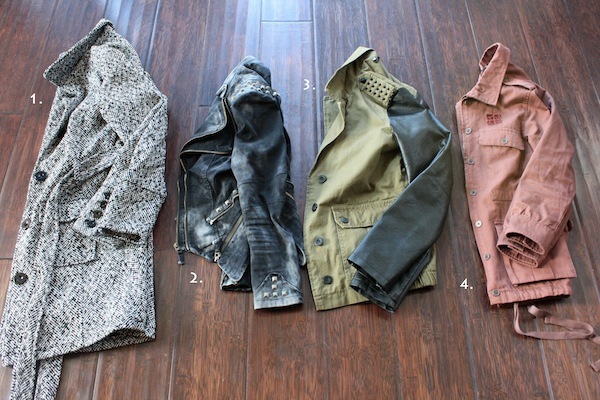 2. studded zipper moto jacket. edgy, cute and so one of my favorite jackets i own! 3. olive jacket with leather sleeves. so obviously these are the winter 2012/2013 jacket of the year! i see them everywhere and somehow own two. they are so cute though and really do add so much to a look! 4. colored jacket. i see blue, yellow, and red jackets everywhere. this maroon color has been my favorite so far! not too intense, but definitely not your boring everyday jacket. wow. was that a novel of a post?! it feels like i've been writing it for an hour. oh wait, i have. I have decided I am just going to come steal all your clothes, sounds like a plan to me anyway! Awesome post! What an AMAZING post!!!! My "wish list" just doubled in size! I have a handful of these pieces, but you've inspired me to get the rest of them! I can't say it enough, this is a really great post. I love it. I want your closet!!!! HA! Great post! Now how about a peek into your actual closet?! Would love to see all your clothes!! That is an amazing list!!! you are making me want to go shopping!! This is SUCH a great post! Seriously so fun to read through and be like "Ooo! I have that." or "Hey, I've got like all of these! I can do this!" ;) Thanks so much for sharing your basic secretes. You should come up with a bunch of outfits using these pieces to show us how you can really mix and match! Where do you buy your basic white tee? ?